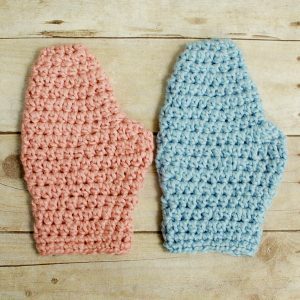 Baby gifts are my favorite thing to crochet, but I wanted something different than my usual go to gifts. 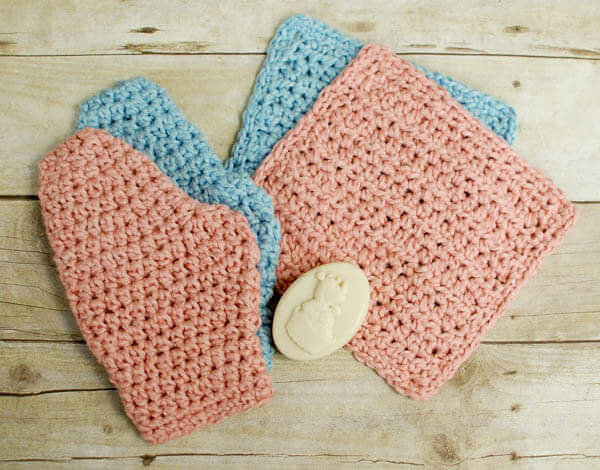 I thought a baby crochet bath set paired with some nice soaps and bath accessories would make a great gift … pretty, yet useful, with lots of handmade charm! Gauge approximately 10 hdc and 8 rows equals 4 in. 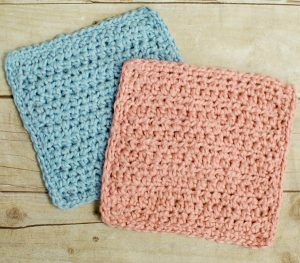 One skein makes 1 bath mitt and washcloth set. Save this pattern to your Ravelry library. Ch 6 (counts foundation ch and 1st hdc of Round 1). Round 1: Work 1 hdc in 3rd ch from hook and into each of the next 2 ch, work 3 hdc in last ch; working along opposite side of ch, work 1 hdc in each of the next 3 ch, join to work in the round — 10 sts. Round 2: Ch 2 (counts as hdc here and throughout), work 2 hdc in next st, 1 hdc in each of the next 2 sts, 2 hdc in next, 1 hdc in next, 2 hdc in next, 1 hdc in each of the next 2 sts, 2 hdc in last st, join — 14 sts. Round 3: Ch 2, work 1 hdc each st around, join — 14 sts. Round 4: Ch 2, work 2 hdc in next st, 1 hdc in each of the next 4 sts, 2 hdc in next, 1 hdc in next, 2 hdc in next, 1 hdc in each of the next 4 sts, 2 hdc in last st, join — 18 sts. Round 5: Ch 2, work 1 hdc each st around, join — 18 sts. Round 6: Ch 2, work 2 hdc in next st, 1 hdc in each of the next 6 sts, 2 hdc in next, 1 hdc in next, 2 hdc in next, 1 hdc in each of the next 6 sts, 2 hdc in last st, join — 22 sts. Round 7: Ch 2, work 1 hdc each st around, join — 22 sts. Round 8: Ch 2, work 1 hdc each st around, join — 22 sts. Round 9: Ch 2, work 1 hdc each of the next 14 sts, 3 dc in next, 2 dc in next, 3 dc in next, 1 hdc in each of the last 4 sts, join — 27 sts. Round 10: Ch 2, work 1 hdc each of the next 14 sts, 1 dc in each of the next 8 sts, 1 hdc in each of the last 4 sts, join — 27 sts. Round 11: Ch 2, work 1 hdc each of the next 17 sts, hdc2tog, 1 hdc in each of the last 7 sts, join — 26 sts. Round 12: Ch 2, work 1 hdc each of the next 5 sts, hdc2tog, 1 hdc each of the next 11 sts, hdc2tog, 1 hdc in each of the last 5 sts, join — 24 sts. Round 13: Ch 2, work 1 hdc each of the next 4 sts, hdc2tog, 1 hdc each of the next 10 sts, hdc2tog, 1 hdc in each of the last 5 sts, join — 22 sts. Round 14: Ch 2, work 1 hdc each of the next 15 sts, hdc2tog, 1 hdc in next, hdc2tog, 1 hdc in last st, join — 20 sts. Round 15: Ch 2, work 1 hdc each st around, join — 20 sts. Round 16: Ch 2, work 1 hdc each st around, join — 20 sts. Round 17: Ch 1, work 1 sc each st around, join — 20 sts. Round 18: Ch 1, work 1 sc each st around, join — 20 sts. Ch 19 (counts as foundation ch and 1st hdc of Row 1). Row 1: Work 1 hdc in 3rd ch from hook and each ch across, turn — 18 sts. Row 2: Ch 2 (counts as hdc here and throughout), work 1 hdc in next st and each st across, turn — 18 sts. Rows 3 through 13: Repeat Row 2. Edging: Ch 1, work 1 sc in each st across, work 3 sc in corner st, sc evenly across side edge, 3 sc in corner, 1 sc in each ch across, 3 sc in corner, sc evenly across remaining side edge, 2 sc in same st as 1st sc. Is the mitt adult sized? It fits my hand, but it wouldn’t fit for my hubby!